Severe flooding has many low-lying soybean fields underwater. As the water dissipates yield potential and replant questions will arise. Flooding can be divided into either water-logging, where only the roots are flooded, or complete submergence where the entire plants are under water (VanToai et al., 2001). Water-logging is more common than complete submergence and is also less damaging. Soybeans can generally survive for 48 to 96 hours when completely submersed (Image 1). The actual time frame depends on air temperature, humidity, cloud cover, soil moisture conditions prior to flooding, and rate of soil drainage. Soybeans will survive longer when flooded under cool and cloudy conditions. Higher temperatures and sunshine will speed up plant respiration which depletes oxygen and increases carbon dioxide levels. If the soil was already saturated prior to flooding, soybean death will occur more quickly as slow soil drainage after flooding will prevent gas exchange between the rhizosphere and the air above the soil surface. 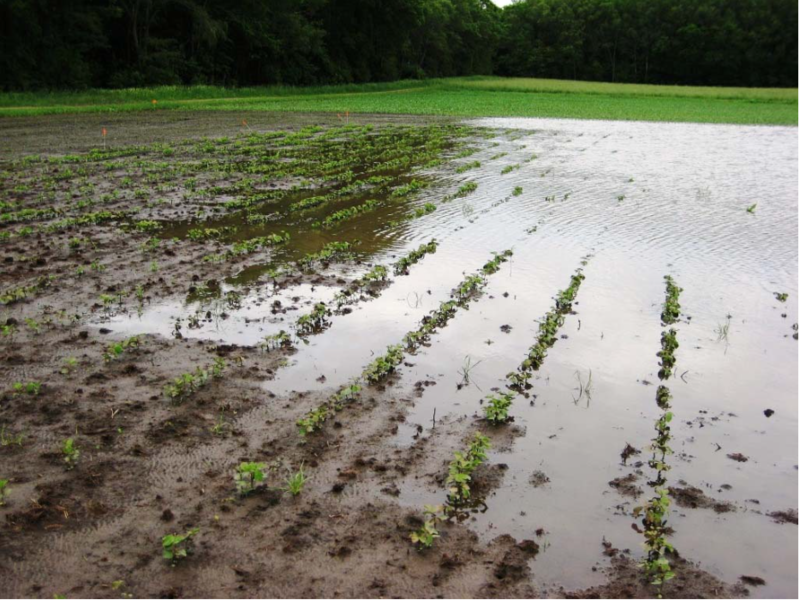 Soybeans often do not fully recover from flooding injury. Image 1. Flooded soybean field located at Arlington WI, June 8th 2008. Once we can get back into the fields the decision to replant will be based on the yield potential of the current stand relative to the cost and yield potential of the replanted soybean field (Table 1). Before any decision to tear up a field is made make sure you contact your crop insurance agent to discuss coverage and you have the replant seed on your farm or at least en route. As we all know seed supplies are tight and replant acres will be high. Also remember to check herbicide labels for plant back restrictions if you are planning to plant soybean into a flooded corn field. Since full season maturity group soybeans are unrealistic for planting this late only early and mid-group soybean cultivars should be considered. The average yield potential for soybean planted in late June in southern WI is in the 30 to 35 bu yield range (Figure 1). For yield potential and harvestability, (a combine may not be able to pick up the lower pods) a grower should plant if possible a mid maturity group soybean instead of an early maturity group for their geographic area. Figure 1. 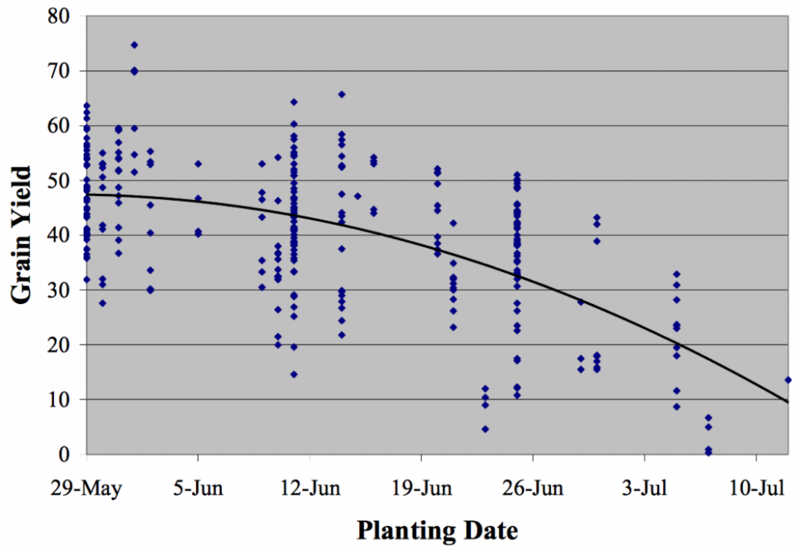 Planting date effect on grain yield of early to mid maturity group soybeans (0.4 to 1.8 RM) in southern WI (Data from early 1990s planting date study). To maximize yield potential in late planted soybean, a minimum of 180,000 plants per acre is required in a drilled system as yield potential in rowed beans would be significantly reduced due to decreased canopy development. To achieve 180,000 plants per acre a grower may have to seed as many as 225,000 seeds per acre. Borges, R. (2004). Soybean management and excessive soil moisture.Boru, G., T. Vantoai, J. Alves, D. Hua, and M. Knee. 2003. Responses of Soybean to Oxygen Deficiency and Elevated Root-zone Carbon Dioxide Concentration. Annals of Botany, 91: 447-453. VanToai, T.T., S. K. St. Martin, K. Chase, G. Boru, V. Schnipke, A. F. Schmitthenner, and K. G. Lark. (2001) Identification of a QTL associated with tolerance of soybean tosoil water-logging. Crop Sci. 41,1247-1252. VanToai, T. Y. Yang, P. Ling, G. Boru, M. Karica, V. Roberts, D. Hua, B. Bishop. (2003) Monitoring soybean tolerance to flooding stress by image processing technique. In T.T. VanToai, et al. (ed) Digital Imaging and Spectral Techniques: Applications to Precision Agriculture and Crop Physiology. ASA Special Publication No 66. The American Society of Agronomy. Madison, WI. Pp 43-51.